Discussion in 'Apple iPad News' started by iDan, Feb 3, 2010. Chalk another one up for Apple. According to the Wall Street Journal publishers, McGraw-Hill Cos, Houghton Mifflin Harcourt K-12, Pearson Education, and Kaplan Inc. have all signed to bring their textbooks to the iPad. ScrollMotion will be the company called upon to provide the technology that will covert the old media to the new e-format. Though Apple didnâ€™t outline its strategy to target the educational sector with its iPad last week, people familiar with Appleâ€™s thinking have said that the iPadâ€™s use in schools was one of the focal points of discussions in developing the product. In its exploration of electronic book technology, it thought particularly about how it could re-invent textbooks, these people said. 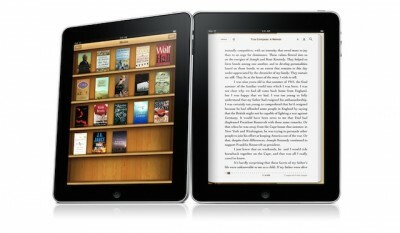 Apple declined to comment on the role of textbooks on the iPad. Apple has an edge in the educational sector because its Macintosh computers have always enjoyed a strong following in the academic sphere, and it already offers educational audio and video content through its iTunes U service. If all textbooks will be available this will be my prime use for the iPad, college books are too hard on the wallet this would be a perfect solution. Well, wait until you see the pricing before making that decision. I think it's great and if schools start picking these up in bulk that would be cool, but to be honest I don't think iPad's are proper for schools. Too much potential distraction... a book is just that, a book and pretty damn sturdy. They may not be proper for high and middle schools but to people like me in college paying for my education I literally can't afford to be distracted. Therefore I don't see it as a deterrent to my education. But I know that some other people would not be able to resist its other features. This is why a greater log on system could be put in place. In the case of my college we have a log on process that requires a certificate authentication from the device accessing the network and you log on as a guest and are then allowed to look at websites the school allows. You could modify the system to only allow network access at certain times to unknown devices. And as for games on the iPad....well I guess it just chalks up to if you can muster up the responsibility to pay attention, I mean you can't stop people from doodling during class or playing tic tac toe. I've got to agree with scotty, it would be great for college. I could get so much more studying done if I could take all my books into a bar or on a train. Or take all my books to work and read on break. It would be great for college. My fear is that they won't discount the electronic copies. It seems like they always want full price for electronic copies with no resell value. I'm sorry I thought you were here supporting the iPad endeavors, but from the looks of that statement I would think otherwise. In my thoughts, I feel that this is the wave of the future and Apple is on the cusp of that wave with bringing text books to e-books on their iPad. Books are still great, don't get me wrong, but this is certainly an area where there is much opportunity as well as convenience either way and I look forward to it.